Big-Risk = Big-Return is true for individual securities. But not for a portfolio. A common misconception for investors (and traders). Risk-Reward has a positive correlation, but it’s not perfect. Risky securities are diversifiable by lower correlated/negative correlated securities. By buying low correlated securities to hedge your risky security, are you lowering your upside? No. You’re lowering your downside. For investors, capital preservation is more important than the growth of capital. The bigger the investment loss, the greater the gain required to break even. A 20% investment loss requires a 25% gain to get back to the initial investment value. Whereas a 40% loss requires 67% and 70% loss requires 233%. The best offense is a good defense. If you invest $10,000 in S&P 500 ETF and a recession causes the market to drop 30%, the $7,000 value would need to gain 43% to get back to $10,000. Portfolio 1 is invested 100% in S&P 500 (SPY). SPY’s annualized standard deviation is 15%. Portfolio 2 is invested 60 and 40 in S&P 500 (SPY) and Investment Grade Bond Fund (FBNDX). Both are 0.31 correlated, based on annual returns. Portfolio 3 is invested 33.34%, 33.33% and 33.33% in S&P 500 (SPY), Investment Grade Bond Fund (FBNDX) and U.S Real Estate ETF (IYR), respectively. IYR is 0.69 correlated to SPY. 0.63 correlated to FBNDX. Correlation is based on annual returns. * I initially wanted to backtest them for 30 years, but since IYR was the only real estate ETF I could find with the earliest fund inception date (June 2000), the backtest is from Jan 2001 to Dec 2016. ** Link to the data above can be found here. Each portfolio is rebalanced annually. Dividends and distributions are reinvested. Taxes and transaction fees are not included. Here’s the growth of each portfolio over the past 16 years. Port 1 has returned annual growth rate of 3.26%, after inflation. Port 2 has returned annual growth rate of 3.36%, after inflation. Port 3 has returned annual growth rate of 4.75%, after inflation. Portfolio 1 and 2 have very similar returns. However, the traditional 60/40 portfolio (port 2) took much less risk than all-in portfolio (port 1). Port 2 had a maximum drawdown of 35% while port 1 had 51%. Portfolio 2’s standard deviation (9%) was almost half the stdev of portfolio 1 (15%). Port 3, on the other hand, had 45% max drawdown with a standard deviation of 11%, both in the middle of port 1 and port 2. However, they returned much higher. 3 Portfolio Backtest. January 2001 – December 2016. The “Final Balance” and “CAGR” numbers you see above are not inflation-adjusted. Also, port 3’s Sharpe ratio, Sortino ratio, and Treynor ratio are all higher than the other two. There are a lot of things to look at when determining which portfolio might be the best for a long-term investor. My favorite is portfolio 3, although the volatility is higher than portfolio 2. REITs (in port 3) provide a strong portfolio diversification with lower exposure to market volatility and attractive dividends. You can see the backtest here for yourself. 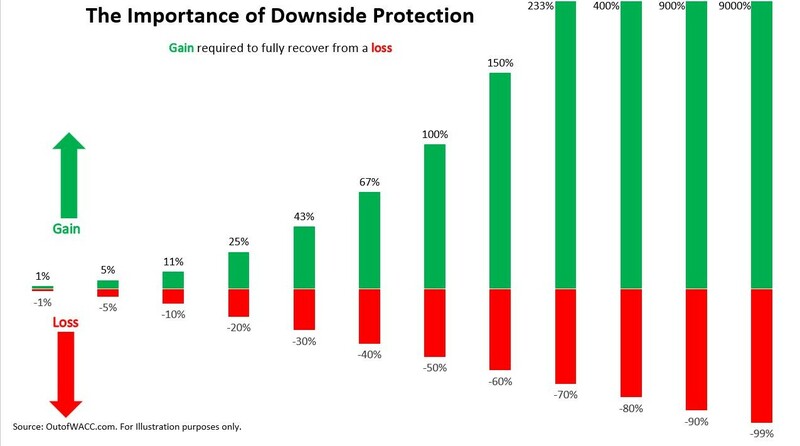 Downside protection strategies may help prevent investors from their bad habits of overreacting to downside volatility and incorrectly timing the market, missing the boat of high returns. 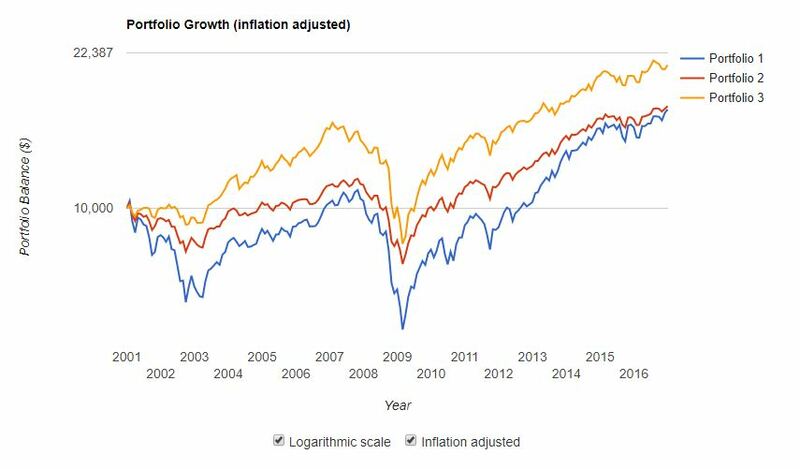 Over the past year, S&P gained 18.10% while an average investor gained half of the growth. 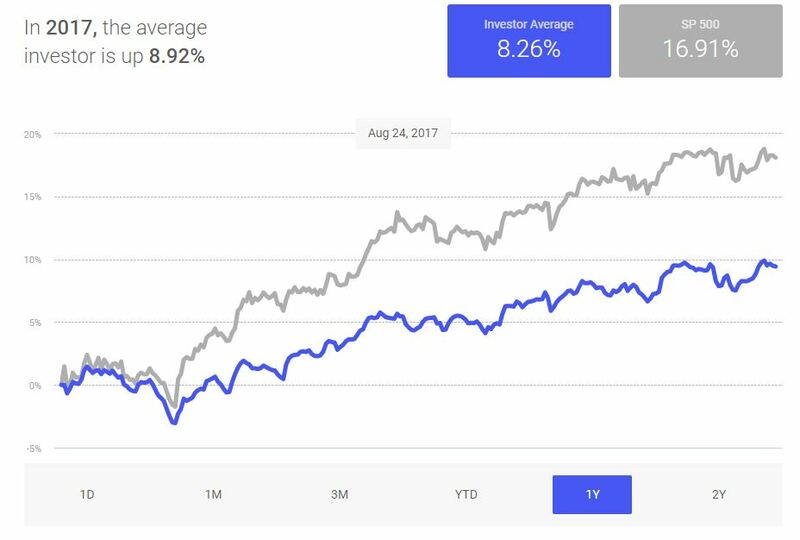 S&P 500 vs Average Investor Return. 1-Year up to September 8, 2017. If you are a passive investor, consider downside protection strategies to limit volatility and build wealth over the long-term. Bonds (Finance 101) such as Treasuries, high-yield bonds, TIPS, etc. International equities (different geographies, different returns/risks), such as, emerging and frontier market equities, etc. Dividend-paying stocks (stronger capital appreciation potential, with low volatility). 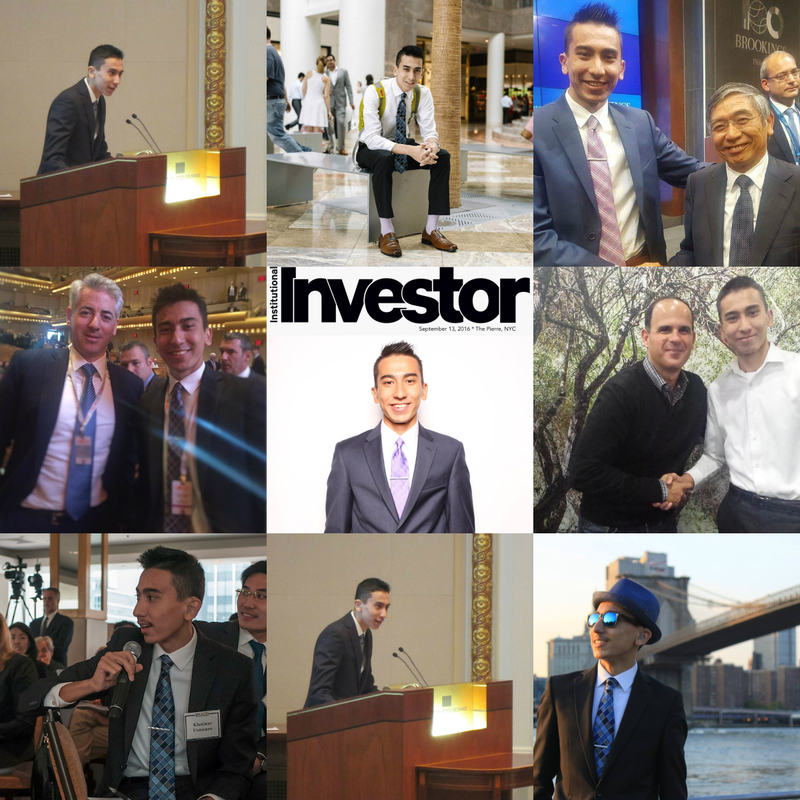 I endorse the idea of employing a multi-asset strategies that lower the downside potential while increasing the upside potential or even decreasing the upside potential less than the decrease in the downside potential. I am not saying you should allocate your portfolio to every asset there is. It depends on your goals, lifestyle, risk preferences, your responsibilities, the investment % of your overall capital, etc etc etc. How you allocate each security is up to you (or your financial advisor), or me me me me. No portfolio is risk-free, but minimizing the downside can help mitigate the pain inflicted by market “fire and fury” and a changing risk landscape in globalization era. If you have any questions/comments/suggestions, feel free to contact me personally and/or leave a comment below. PS: Maybe make Bitcoin/Ethereum/Litecoin 5% of your portfolio. PS: Active traders should also minimize the downside risk, especially if you work, have school, etc. PS: Never mind. Thank you for reading. Don’t forget to subscribe.